If anything, I was trying to spare ol’ girl from a rant consisting of 324,356,316 tweets back to back trying to explain. It’s just not a question answered easily. I’m still gonna give it a shot today, though. For starters, let’s talk about capitalism. Yes, capitalism. We are a country driven by capitalist principles. Um, in short – “No money, mo’ problems.” The goal is to be driven by the dollar – the more of ’em you have, the more opportunities granted to you. 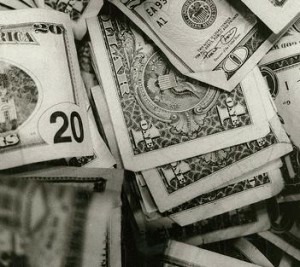 The less of ’em you have, the more inspired you should be to innovate in order to get more dollars. Your drive to have more money is supposed to compel you to create and contribute to not only the growth of your community, but your wallet. Say you start a business. Things are going well, but you’re not making as much of a net profit (defined as the amount of money made after all of the company’s bills are paid) as you’d like. So, you start figuring out where the money is leaking… and you begin plugging the holes. Sure enough, you’ve increased your net profits by decreasing how much it costs you to make your product. Let’s apply this principle to a dish. How ’bout scalloped potatoes? If I decide to make scalloped potatoes – assuming I don’t already have any of the ingredients in my home – I have to purchase potatoes, cheese, heavy cream, butter, salt. That looks like a $10 dish. If I just hit the aisle of my grocery and grab a box.. it might be three dollars. Depending on the brand, that’s a big might. On the part of the company, though, it’s a different story. Sure, I have to purchase the food products necessary to create the dish. Sure, I have to buy the factory and its equipment. Yeah, there’s the salaries of the workers who staff my factory. I have to pay someone to ship my products to their locations. Depending on the brand, I also have to pay for research and development, marketing and on top of all of this.. I have to sell it to the grocery stores at a respectable price so that they can make their profit. Right? Going back to that example with your business from earlier, how can they decrease their expenses and increase their net profit? Well, instead of using actual cheese, I can find a company who creates powdered “natural flavors” to give my food that cheesy flavor. Instead of cream, I can use some kind of water and cheap enriched flour combination to give the potatoes that kind of creamy allure. I’ll add some salt – hell, salt is super cheap – to still give it that “yum factor.” I’ll use the cheapest packaging possible – a cardboard box and a couple plastic bags. I’ll make a deal to only get my potatoes from one place, so I’ll ensure that they’ll always be cheap. I’ll pay my workers as little as possible – “Hey, I wonder if we can find some of those illegals everyone’s ranting and raving about!” – and before you know it? I’m making my product for a dollar and a nickel, selling it for $2.50 and you’re buying it for $3.25. Money is made. Everyone is happy. Capitalism succeeds. That’s the price. Let’s talk about cost. Taking out the cheese and the cream from the dish removes most-if-not-all the nutritional offerings the dish might have for its eater. The enriched flour used to thicken the mixture has had all of its naturally occurring nutrients removed from it as an unfortunate result of the bleaching process and the effort to extend the shelf life of the flour. This means that everything that was once linked together to offer your system nutrition has been broken apart, regardless of whether or not they “fortified” or “enriched” it with some of the stuff they originally removed from it. Don’t give science so much credit – they’re not putting it back in the same way they took it out, because then it’d negate the point of taking the nutrients out in the first place, right? So… let’s talk about you using either of these options. If I spend $10 on the ingredients to make my own scalloped potatoes I’m buying a 5lb bag of potatoes, a two cup bag of shredded sharp cheddar, a pint of heavy cream, a couple sticks of butter,and maybe some tarragon and parsley. Unless I’m making one monstrous dish, I’m clearly not about to use all of this at once. The benefit of spending my $10 is that I’m buying ingredients… not spending $3 on one item as a part of my dinner. I may only use 3 of my 15 potatoes that came in my bag. I may only use 2/3 of a cup of cheese. Half a cup of butter (half a stick in a 4-stick pack), half a cup of cream. See how much I have left over? Three dollars for the box of everything. Freeze-dried potatoes. Cheese-flavored powder and… well, just add milk. For someone who’s primary focus is time, this is the great option. You can have “big ticket dishes” for minimal time. Making scalloped potatoes from scratch means I’ve got to cut potatoes. Ugh. This stuff sells because, as a driving factor in capitalism, someone was able to make money off of making it easier for you to enjoy the dish with less time and effort involved. It will continue to sell for as long as it serves that purpose. That will never change. For someone who’s primary focus is money, this seems like the better option but I’m not so sure. Spending $3 for a single item seems like too much for me especially when for$7 more, I can get enough ingredients to accommodate mashed potatoes, baked potatoes, scalloped potatoes, potato pancakes, hash browns, french fries aaaaand potato chips. If I play my cards right, I can make a 4lb bag of potatoes last a month. I can’t do anything with a box of freeze-dried potatoes and cheese powder but pray to Almighty Food Jesus that it tastes good. For someone who’s primary focus is nutrition, though? You already know. You’re not going to find it in a box. As you can see, though, this also explains why you are more likely to find obesity in areas without lots of money. Those areas consist of people with very little time and money to “waste” on something like food. But, since it’s nice to have a “big ticket dish” every now and again, they’ll indulge. Or… they like the fact that they can “eat like the rich folk.” Ironically, the “rich folk” aren’t even eating anymore. They’re going out of their way to avoid looking like the folks eating the processed food and suffering from it. Interesting cycle, that is. The cost to your health… vs the price you pay. Which is more important? In these times, your wallet speaks an awful lot louder than anything else, so can anyone blame you for choosing the processed foods? Of course not! That’s what they’re there for. They’re there to fulfill that need. But realistically speaking, where you save today is where it costs you tomorrow. Since we’ve started eating healthier, our grocery bill has gone down. Since we’re not buying overpriced boxed foods and rarely eating out, we’re saving a ton by cooking at home and taking left-overs for lunch the next day. It’s important to look at the big picture you’ve spelled out here. Oh. Man. As a grad student I constantly have to try and balance saving money with eating healthy/well. And I grew up in a house where we shopped at Whole Foods, ate fresh cheese and veggies, best cuts of meat, etc. One thing that I’ve had to do is eat frozen veggies. At first the idea was so weird to me, because it’s not something I ever ate at home. But it’s either buy frozen veggies or waste vegetables because I don’t eat them fast enough. Another thing I do is buy generic food, especially canned veggies. I know you don’t love canned foods but I prefer the beans from cans after my disastrous attempt, LOL. Plus there’s canned tomatoes for sauce as well. In the future I might try to make sauce from real tomatoes, but I haven’t had the time yet. Another thing, and this might sound obvious, but I try not to buy things that I won’t eat. Lots of times I might get the idea to make something kind of fancy and special, and so I have to buy specific ingredients. I’ve learned that I might not always have time to do it, and it’s better to buy staples that can be used for several different foods. Sorry for writing a novel on your comments, but these are things that have helped me. I can’t wait to see any more suggestions you might have! Ahhhh! You’re ahead of me! LOL! Spot on, though. I wrote about the generic foods thing before – many people don’t know that those foods are often made by the big name brands (I believe the same folks that make the generic store brand aluminum foil make Reynolds Wrap?) and just wind up paying for a brand instead of a useful product. Our downfall as a nation is not understanding that we vote and speak with our dollar. That’s the converse of capitalism – you go where the money is. If more of our dollars went toward organic or “natural/earthy/etc” then more of our manufacturers would cater to our desires. The problem is that they also know there’s enough of us more concerned with dollar amounts and spending, that there will always be a market for cheap foods. It’s hard out there for a healthy eater! I can vouch for the big companies making the same generic stuff. I was a tech consultant and I worked for mostly food companies. You could see in their databases their big name stuff and also store brand food as well that they distributed and sold. Really there’s no taste difference to me either, though I feel like my taste buds are not that finely attuned. I also agree that no matter what these companies say, they don’t give a good gosh darn (LOL) about you. They just want your money and will do anything to get it. Don’t give it to them! It just makes me mad that I can’t find a Trader Joe’s or Whole Foods in S. L.A. It’s a form of consumer apartheid to me. It’s very difficult for me to write about grocery store options, when there are areas that don’t even have “good” grocery stores, let alone ANY grocery stores. Food deserts are very real. The only problem I have with writing about it is the fact that I cannot come up with any viable answer, solution or reaction that will be helpful to people who are truly going through it. It feels privileged on my part at best, and neglectful and classist at worst. @Gina, have you ever tried any of the local grocery delivery businesses? When I lived in NYC I sometimes would use Fresh Direct in the winter when I was too lazy to head to the city to visit the “good” grocery stores. I know several other big cities have similar businesses. 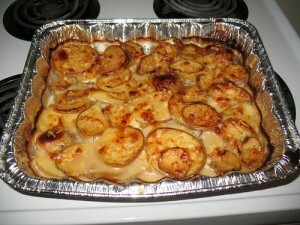 I used to love Au Gratin potatoes from the box with everything within. LOVE THEM! when you are lazy its so easy to just buy the damn $3 box! its not even about the cost for me…just the ease. But I know how to cook, and I know better NOW. Trust me… choosing to bang on scalloped potatoes was not an accident. I was soooo mad that I went to a friend’s place who “cooked” scalloped potatoes, only to see the box in the trash? [insert sobbing angry face] Not after I got my tongue all excited, no you will not serve me box food! LMAO! @Elita. Delivery was great in NY. Trader Joe’s here does not offer it as far as I know. The trade off is that you won’t be able to use coupons (not relevant to TJs), therefore you will pay more. NOt good for me since I am a coupon/rebate Queen. By the way, I haven’t met anyone here in L.A. that uses delivery.